Osaka may be most famed for its street food, vibrant nightlife and plentiful shopping opportunities, but Japan’s second-largest city is also a historically and culturally rich metropolis perfectly suited to on-foot exploration. This more refined side of Osaka is best experienced in Nakanoshima, an oblong-shaped island sitting in between the Dojima and Tosabori rivers. It’s home to wide, tree-lined streets, numerous museums and stylish restaurants and cafés, while also serving as the city’s administrative and commercial centre. 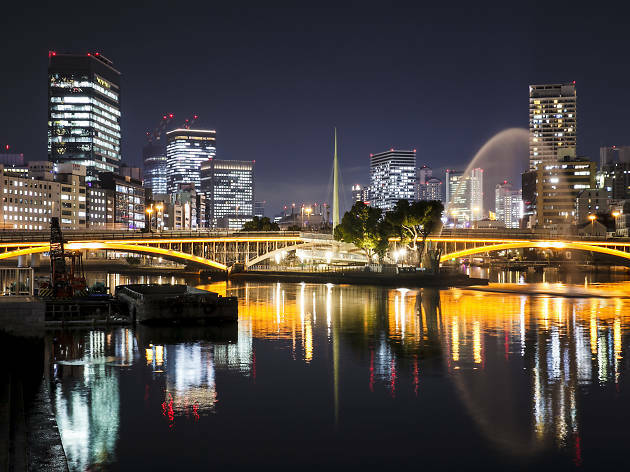 Follow us on a one-day stroll along Osaka’s waterways and discover the sights, tastes and energetic atmosphere of a district visibly on the rise. Start your day right with a luxurious buffet breakfast at the Rihga Royal Hotel Osaka (5-3- 68 Nakanoshima, Kita-ku. 06 6448 1121. www.rihga.com/osaka. ¥2,800, breakfast served 6.30am-10am daily), where the usual croissants and omelettes can be combined with a wide range of Japanese pickles, tofu, miso soup and even ‘ham steaks’. Once you’re charged up, head down to the Tosabori river and follow it a few hundred metres east to reach Graf (4-1-9 Nakanoshima, Kita-ku. 06 6459 2100. graf-d3.com. Tue-Sun 11am-7pm), a super-trendy shop and café run by the Kansai region’s leading design studio. Great for styling up your home with Japan-made furniture, tableware, accessories and ceramics, the store deals exclusively in items designed by Graf or created by artisans with ties to the studio. This emphasis on local production is also evident at the café, where the menu consists of simple lunch sets and tasty pastries made with ingredients sourced directly from contracted farmers. Next, keep going in an eastward direction to reach Nishikibashi, an arched concrete bridge now open only to pedestrians, and check out the art depicting Edo- and Meiji-era Osaka for an idea of what the area looked like 150 years ago. Then, turn north and walk all the way up to the Dojima river and cross the Garden Bridge to find a cluster of traditional houses by the water. One of these gorgeously renovated abodes is home to your lunch spot for the day: Ristorante Rinascere Dojima (1-1-8 Dojimahama, Kita-ku. 06 6345 8505. rinascere-dojima.jp. 11.30am-3pm, 5.30pm-11pm daily). Serving up modern Italian cuisine with a Japanese twist – think unagi pasta or tofu with olive oil – the restaurant boasts nice views of the river and the Osaka Bank of Japan building, but keeps prices very reasonable. ¥2,380 gets you a five-course lunch while the pasta sets go for ¥1,240. Reservations recommended. Kick off your afternoon activities at the Museum of Oriental Ceramics, Osaka (1-1-26 Nakanoshima, Kita-ku. 06 6223 0055. www.moco.or.jp/en/. Tue-Sun 9.30am-5pm), which houses around 6,000 pieces of pottery mainly from Korea and China. The world-renowned collection of East Asian ceramics is particularly plentiful, and is counted among the best of its kind anywhere. When you’ve had enough of ancient pots, order a coffee-filled one instead at the nearby Garb Weeks café (1-1-29 Nakanoshima, Kita-ku. 06 6226 0181. www.garbweeks.com. Mon-Fri 11.30am-11.30pm, Sat, Sun 11am-11.30pm), where you can also fight the afternoon slump with a slice of cake or power up with Neapolitan-style pizza. On a sunny day, consider grabbing a seat on the riverside terrace or find a bench at the nearby rose garden in Nakanoshima Park (1 Nakanoshima, Kita-ku). This spacious spot of greenery is at its most spectacular in May, when around 4,000 roses burst into bloom, but also merits a visit in early autumn. The most touristy stop on your stroll will most likely be Osaka Castle (1-1 Osakajo, Chuo-ku. 06 6941 3044. osakacastle.net/english), which sits just southeast of Nakanoshima but close enough to be reached on foot. First built in 1583 by conquering warlord Toyotomi Hideyoshi, the fortress has been destroyed and rebuilt several times over the centuries – the current version, equipped with elevators and other modern conveniences, was completed in 1997 – but remains a symbol of the city’s illustrious history. Dodge the hordes of travellers snapping selfies and taking pictures with dressed-up ‘samurai’ in front of the main keep and climb up on one of the surrounding walls to survey the majestic moats and steep stone foundations that used to efficiently deter any potential invaders. The spacious grounds can be accessed for free, but entrance to the castle museum (9am-5pm daily) costs ¥600. 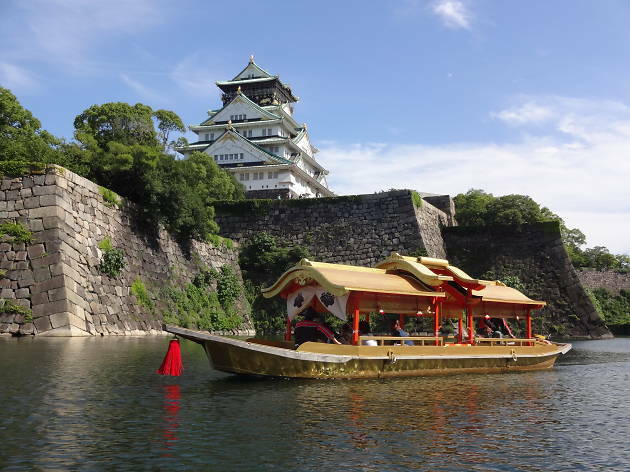 If you’re looking to go all out, board the golden ‘pleasure boat’, modelled on a vessel once used by Hideyoshi himself, and cruise the outer moat like the aristocrats of old. This ship runs between March and November (10am-4pm). You’re sure to have worked up an appetite at the castle, so now’s the time to set course for the bundle of hip restaurants known as Kitahama Terrace. These dozen or so eateries make good use of their riverside perches and attract diners with open-air seating right by the water. Cuisine choices range from Spanish tapas and French bistro fare to Australian-inspired café grub, but our top recommendation would have to be the innovative washoku at Kitahama Urara (1-1- 12 Kitahama, Chuo-ku. 06 6121 2038. Mon-Sat 5pm-11pm). The chefs at this serious but homely Japanese restaurant turn out finely balanced seasonal dishes that wow both the eyes and the tastebuds. You can either book one of the kaiseki courses or order off the à la carte menu – whatever your choice, there’ll be sake to go with it, as the owner here is also an expert nihonshu dealer. 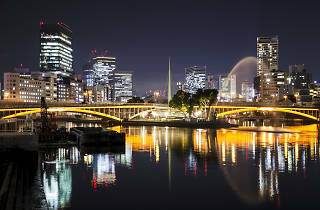 Nakanoshima shows its most spectacular side after sunset, when most of the island’s bridges and other landmarks come to life with colourful illuminations. The main attraction is the red-brick Osaka Central Public Hall (1-1-27 Nakanoshima, Kita-ku), a neo-Renaissance beauty designed by Kingo Tatsuno of Tokyo Station fame and completed in 1918. Now considered one of Osaka’s most iconic structures, it gets lit up every evening and occasionally serves as a canvas for projection mapping displays. Other night-time sights worth a look include Tenjinbashi, Tenmabashi and Suishobashi bridges, as well as the pillars of the elevated Hanshin Expressway. The after-dark hours are also when to catch riverside Osaka’s cherry blossoms at their most breathtaking. Stroll east along the north shore of the river from Tenjinbashi to enter a striking tunnel of illuminated yozakura (night sakura), stretching all the way up to the Japan Mint building (1-1-79 Tenma, Kita-ku). Blossom season itself usually starts from late March, but mid-April is when the Mint opens up its famous ‘sakura walkthrough’ to the public. This 560m passageway is renowned as one of Osaka’s very best flower-viewing spots and always attracts massive crowds – look out for the precise opening dates on the Mint’s website (tinyurl.com/TOTmint-sakura).